For 22 years, I have individually created stained glass pieces for you, for gifts, and for trophies and awards to suit any club function. If there's something you'd like that you don't see, your imagination and mine are the only limits! PLEASE EMAIL OR CALL YOUR ORDER IN, 425-334-0101.
in any form without the written permission of the artist. Most of Madeleine's orders go out the door in 3-4 weeks, but certain pieces can take up to 6 weeks for U.S. orders only. At Christmas time and very occasionally during the rest of the year, *some* orders will take 6-7 weeks. Under normal conditions, your order should reach you within 1-5 work days after it is shipped, depending on your location. Madeleine uses both United Parcel Service and the U.S. Post Office, so we need a street address and a post office box if you have both. Foreign orders can take longer. 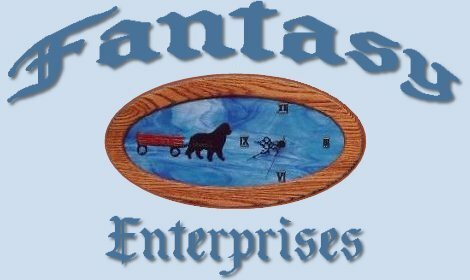 Fantasy Enterprises ships all over the world! The shipping charges listed for each item are for any orders shipped to a U.S. address. Shipping charges for foreign (non-U.S.) orders will be more than what is listed--please contact Fantasy Enterprises for shipping rates when you place your order. All foreign orders will be shipped with the U.S. Post Office. All of the glass designs are Copyright ©1987-2014 Madeleine Boucher. All rights reserved. Deborah Burton (Fuzzy Faces). All rights reserved. This copyright includes *all* printed matter and *all* graphics on this page. THEY ARE *NOT* PUBLIC DOMAIN.